Some legends emerge from the mists of time. Others are clearly created from scratch. The latter is the case in the southern Minnesota town of Montgomery. A combination of the area's Czech heritage and a huge helping of imagination formed the character Big Honza. Locals hope this fictional folk hero will put their town on the map. Montgomery defines itself as the world capital of the kolacky, a traditional Czechoslovakian pastry. Or, as resident John Grimm describes it, "A little bun with some fruit-stuff in it." Czech immigrants settled here in the 1850s and the community of 3,000 has never stopped celebrating its Bohemian heritage. Its annual summer festival, Kolacky Days, brings visitors from all across southern Minnesota. 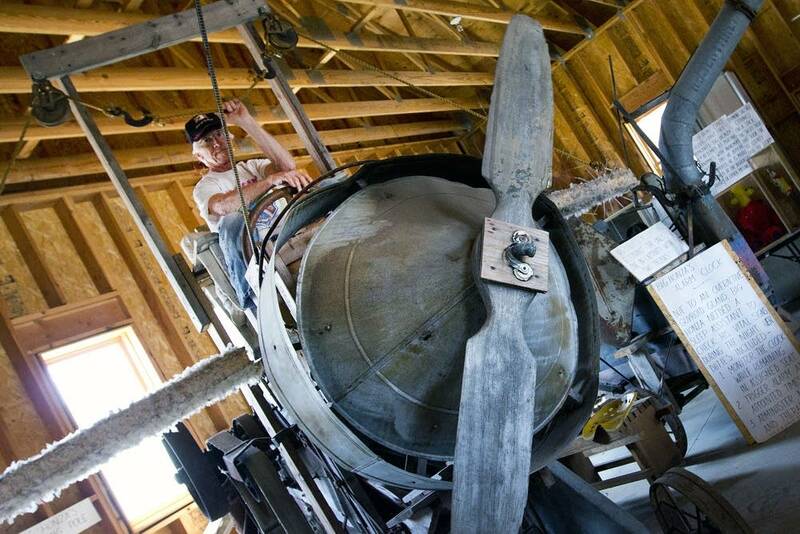 Grimm, a retired pilot, has always had big dreams for this town, long envisioning an identity beyond old-world pastry. "I just thought we needed a little more than that," Grimm said. Enter Big Honza Giganticzech. He's the main character in a musical Grimm produced and performed in town a few years back. "Big Honza was the first settler here in Montgomery," said Grimm. "And he wrote back to his relatives and invited them to come and that's how the community began." To be clear, Big Honza came straight out of Grimm's imagination. "Just a big rugged guy," Grimm continued. "A farmer with big strong hand. He's kinda gnarly." Eventually the show ended. But Big Honza stuck around. 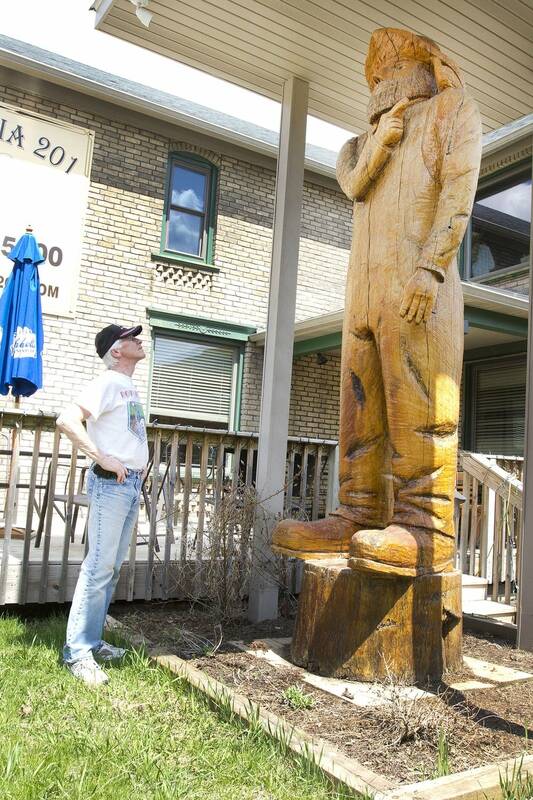 Grimm had the new hometown hero immortalized on main street, commissioning a 12-foot-tall wooden sculpture of Honza, carved with a chainsaw. Big Honza resides in the courtyard of Troy Domine's pizza parlor, so it's Domine who often fields the inquiries from out-of-towners. He tells them of the legendary man "with muscles of steel and a heart of gold," a man "tougher than Roy Rogers and jollier than Santa Claus." 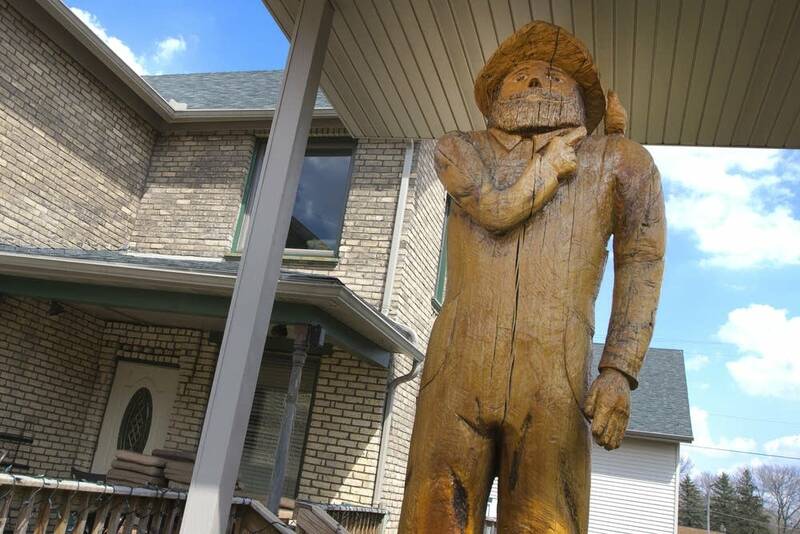 Most are confused, at least until Domine namedrops the state's most famous lumberjack. "Paul Bunyan and Babe the Blue Ox?" he asked. "I mean the Blue Ox? Come on. Get real!" If people can embrace a 94-foot-tall, axe-wielding logger, why not a Czech immigrant "who could skin a mule with his teeth" and "chop a tree down with one hand?" 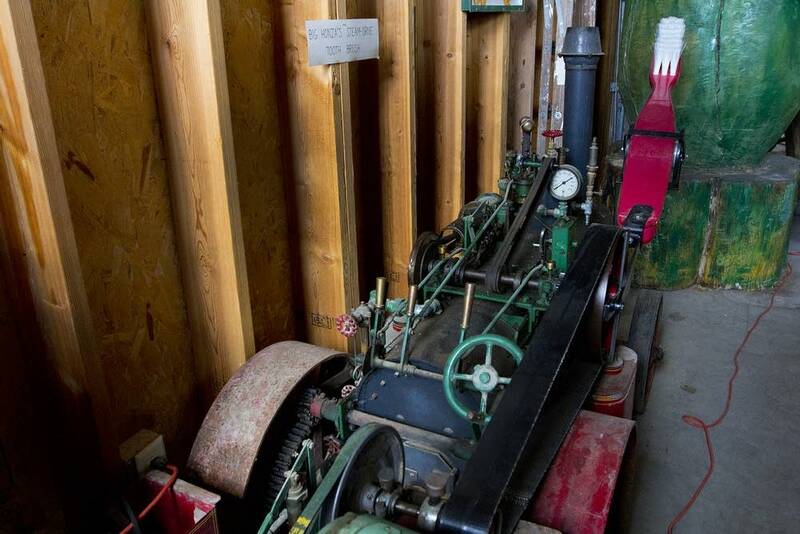 "It's just a fun way to talk about the community and what maybe had been 150 or 200 years ago when the Big Woods was being settled," said Domine. Every good founding father needs a museum in his name, said John Grimm — even a fictional one. So in 2003, Grimm built Big Honza's Museum of Unnatural History. 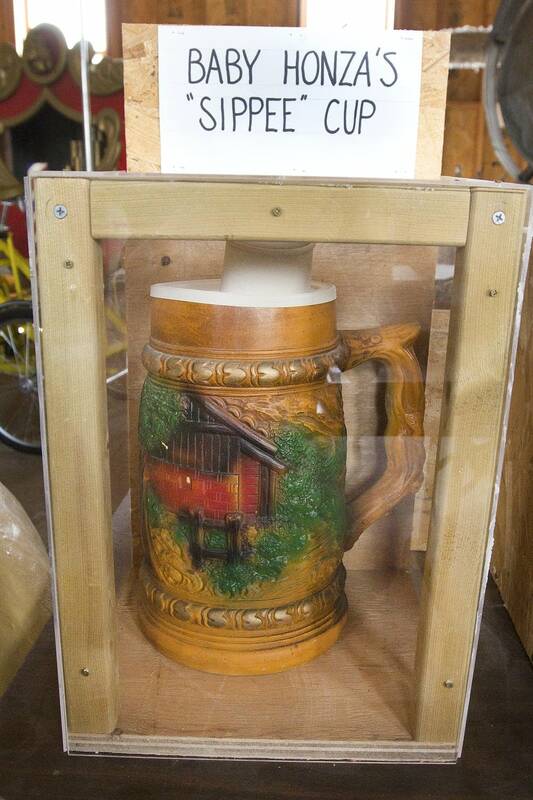 "And then I started filling it with weird stuff," Grimm said. Like a huge, Honza-sized toothbrush powered by a steam engine. "If I plug it in, you'll see how it works," he said as he reached for the power. 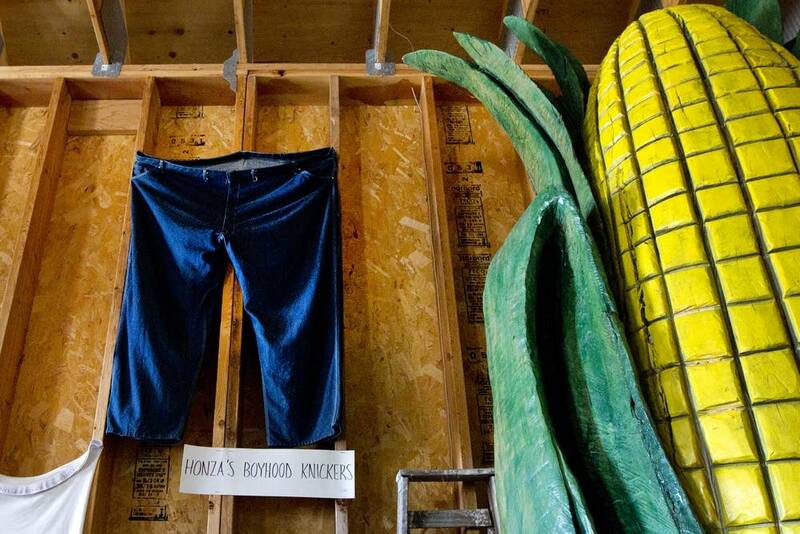 The warehouse is filled with oversized boots, enormous pairs of pants, and Big Honza's first teething ring, a circle of sausage the size of an average human head. "We've got his salad fork. That's an authentic antique pitchfork," Grimm relates with his best tour guide manner. It'd be easy to see John Grimm as some guy with a lot of time on his hands. But with that time, the 72-year-old has also restored the town concert hall, established an assisted-living facility for the mentally ill and turned a defunct resort into housing for homeless veterans. And he's always thinking of ways to enhance the legend of Big Honza. "I wanted to build Mount Czechmore. Mount Rushmore, of course, has the faces on the mountain and all that so I wanted to pile rocks up, a huge, huge pile. And at the top would be Big Honza's likeness. That didn't fly," he admits — it ran afoul of the City Council. "They decided they didn't want me to do that. Ha!" Some of Montgomery's citizens of big fans of Big Honza. "Oh, it's kind of a neat little thing," said one passerby on the main street. Others in this 3-block-long downtown have never heard of the guy. "I have no idea who you're talking about," said another woman. "Now who is he supposed to be?" "He's Big Honza," says her friend, but it doesn't seem to help. "Big Honza? And who's that?" said the first woman. Then there are those who take offense — they swear the statue of Big Honza is making an offensive hand gesture. "That guy standing there has got his finger up," said a man looking back at the statue. Closer inspection reveals that Big Honza is not actually giving anyone the bird, but is, instead, pointing to a bird that sits on his shoulder. At the end of the day, though, Troy Domine is more interested in what tourists think of the town icon. "I don't know that it's so much for the locals as it is for making the community a reason to stop for an hour or two and just take a look and say 'What is this all about?' " he said. Domine believes today's small towns can only survive if they offer something unique. And Big Honza fits that bill. The larger-than-life legend has even brought bus tours to town. "Each community having something that makes them stand out and particularly from a standpoint of attracting visitors, it is important," he said. Montgomery has always used its Czech heritage to promote itself, said Domine. And Big Honza Giganticzech is just an extension of that.